343 Industries’ Dan Ayoub (Studio Head of External Development) and Creative Assembly’s David Nicholson (Executive Producer) were recently featured in a video interview with Windows Central. They talked about Halo Wars 2, obviously, beginning with how it’s a great way to jump in the franchise due to the self-contained story. Halo Wars 2 has a really self-contained story. What’s great about it is that it assumes no knowledge of the extended fiction or Halo games whatsoever. We assume you haven’t played Halo Wars and you’ve never played a Halo game before, and you can see we’ve set the game around that, with the crew of Spirit of Fire set asleep for twenty-eight years. They have missed pretty much everything and the game is unfolding through their eyes, so I always say if you’ve always been curious about Halo but too scared to jump in because you feel like you’d miss so much story, this is really the story to jump in on because it is entirely self-contained and we’ve created some really fantastic new characters as well, and of course some nice nods for people who are familiar with the fiction. Halo Wars 2 will also gets lots of post-launch support, just like Halo 5: Guardians did. The great about this franchise is that we learn from every game. I would say one thing we learned coming out of Halo 5 is that we had great feedback on post-launch support. 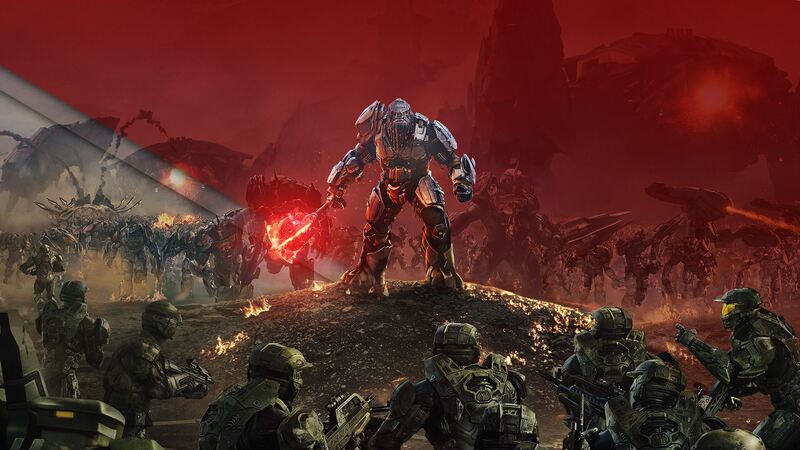 How we continued to support the game after Halo 5 had launched, and you’re going to see that tradition continue with Halo Wars 2. We’ve got a Season Pass, extra content starts almost immediately after the game launches including campaign. We’re going to extend the campaign through post-launch content, players are going to be able to continue along that trajectory; we’re going to have new leaders, we’re going to have new Blitz cards, we’re going to have new units. We’re doing all of these things, as well as countless other tweaks under the hood as time goes on, to really promote and support the game. In this last quote, Dan Ayoub mentioned Blitz. This new mode has been extensively detailed in a blog post on Xbox Wire. In this mode, players will create decks of 12 from card packs earned by playing through the Halo Wars 2 campaign, as well as daily challenges. Every leader will have access to this shared pool of cards that complement their specific playstyle. Each leader can have up to three different decks, and each card features a unit that you can deploy on the battlefield in real-time throughout the course of the match. All units carry an energy cost: the more powerful the unit, the more expensive they will be to deploy on the field. Energy can be earned during a match by collecting energy canisters that are dropped during the action, or by defeating enemies. Then it’s just a matter of strategically deploying a unit that is randomly selected from your pre-made deck. Do you spend your energy on smaller units to build up your forces, or do you elect to save your energy to drop a bunch of Wraiths on the battlefield? Maybe you’d prefer to deploy a fleet of Warthogs to speed around the map and cause havoc? Those are the kinds of choices you’ll have to make when playing Blitz. There will be two variations of the Blitz mode available to players: Firefight and PvP. Firefight will be a wave-based PVE mode, that can be played solo or with up to two friends, against ever-increasingly difficult enemies with the core objective to survive as long as you can and obtain the highest score possible. PvP will have custom ranked and unranked matches that will be 1v1, 2v2, or 3v3 support. These epic battles will all take place on the tactically balanced map, Providing Grounds, and the overall objective is to fill your team’s meter before time runs out. You do this by capturing the three points of conflict placed strategically on the map. The more zones your team controls, the faster the meter will fill. This also presents a series of unique strategic decisions when it comes to capturing and defending these zones, as you’ll need to decide on which unit cards to burn to help achieve victory. As the matches progress, the more it became clear that the Halo Wars 2 team has crafted something unique in the RTS space. Could this be the next MOBA? Halo Wars 2 will be out on February 21st, 2017 for Windows 10 PC and Xbox One.